Tommy James and The Shondells scored major hits in 1966, 1967 and 1968, but 1969 would prove to be their most successful and productive year. They began work on both the Crimson and Clover and Cellophane Symphony albums in late 1968, and both were released in 1969. "Crimson & Clover, released as a single in December 1968, became their biggest hit. The group's first totally self-contained single (written by Tommy and drummer Pete Lucia, produced by Tommy and arranged by the band), it caught on with both the pop and underground audiences. After being unfairly dismissed for over two years as a "bubblegum group, Tommy James & The Shondells suddenly became hip. The single and resulting album with the same title went platinum and also earned Tommy and the group critical respect and acclaim. The group had worked with producers Bo Gentry and Ritchie Cordell since early 1967, beginning with the classic "I Think We're Alone Now. The Gentry-Cordell formula continued to bear fruit with "Mony Mony in the early summer of 1968, but Tommy felt it was time for a change, as he wanted to take control of his own records. After "Mony Mony, Tommy recorded a few sides with producer Gary Illingworth, including "Somebody Cares, the follow-up single. It did well in some markets but had to be viewed as a disappointment after the success of its predecessor. At the same time, the group was working on the "Mony Mony LP, Tommy produced some of the tracks. One song that Tommy particularly wanted to record was "Do Something To Me, previously recorded by Question Mark & The Mysterians without success. Tommy says, "I loved that record. I went crazy when I heard it. I thought it should have been a #1 record." No artist would complain about having a Top 40 hit, but Tommy had different ideas about the direction the group's sound should take. He and The Shondells were in the studio carefully constructing "Crimson & Clover, but Roulette wanted a new single. The group agreed to Roulette's releasing "Do Something To Me to give them time to complete "Crimson." Tommy's instincts proved to be right on the mark. "Crimson & Clover was a perfect single with an unforgettable hook ("Crimson and clover, over and over...") and distinctive vocal effects, which Tommy achieved by running the vocal track through a guitar amp and using the tremolo switch. The single took off like a rocket in late 1968. It reached the Top 40 its second week on the chart and then quickly hit #1. The song's lasting appeal was evidenced when Joan Jett & The Blackhearts took their version (produced by Cordell and Tommy's long-time friend, Kenny Laguna) to the Top 10 in 1982. The Crimson & Clover LP followed in January 1969. The liner notes were written by then-Vice President Hubert H. Humphrey, who had asked Tommy to be the President's advisor on youth affairs during the 1968 presidential campaign. Such an endorsement for a rock group was unheard of at the time. Tommy remembers Humphrey fondly, saying, "We became great friends, and that friendship lasted right up until Mr. Humphrey passed away." While putting the finishing touches on the album, Tommy decided that it should include a long version of "Crimson & Clover. It was common in the late '60s for an album track to be edited for single release, but "Crimson & Clover had been recorded in its "short single version, so it was necessary to either re-record or expand it to create a long version. Tommy opted to lengthen the existing master, and the group duly went back into the studio to record a new middle section featuring a series of solos played in different styles by lead guitarist Ed Gray. The new section was then spliced into the multi-track master. Due to a slight difference in tape speeds, the middle section was a fraction of a tone lower than the first part of the recording. For this reissue, Rhino has corrected the error, and we now hear the long version of "Crimson & Clover in its proper form for the first time. Apart from "Do Something To Me, which Roulette wanted to include on the Crimson & Clover LP since it had been a hit, the entire album was written by Tommy and members of The Shondells. They arranged all the tracks, and Tommy produced it. "That album was magic, Tommy says. "It was a milestone -- the first record that I produced all by myself and used the band on all the tracks. And I can't even begin to tell you how professionally important it was, because if it had not made it, with the drastic change I was making in our sound, I don't know what would have happened. Certainly my credentials as a producer would have suffered a lot. It was a very scary thing for me, but it paid off." Tommy and bass player Mike Vale wrote "Sugar On Sunday for the LP. If not for the incredible wealth of material the group turned out in 1969, it might have been a single for them. Instead, it was released as a single by The Clique, which hit the Top 25 with it in October 1969, in a version practically identical to The Shondells'. The success of The Clique's version led to Tommy's first efforts as a producer for other artists, later that year. He and Bob King, a friend from his hometown of Niles, Michigan, wrote and produced "Church Street Soul Revival, one of The Exiles' first singles, which was released in late 1969. (Tommy later recorded the song himself.) The Exiles later became simply Exile, achieved fame with "Kiss You All Over, and continue to have hits on the country charts. In 1970, Tommy and Bob King also wrote and produced "Tighter, Tighter, a smash hit for Alive 'n' Kickin'. "I'm Alive is one of the most powerful songs on Crimson & Clover -- with its fuzz guitar, driving organ (by Ronnie Rosman) and guttural screams, it would not be out of place on any compilation of '60s punk classics. The Clique also recorded it as the B-side of "Sparkle And Shine, a superb song written by Tommy, Bob King, and Ritchie Cordell. Tommy produced both sides of The Clique's single and sang backing vocals. In 1975, Blue Swede hit the charts with a medley of "I'm Alive and Joe South's "Hush." "Kathleen McArthur features Tommy's particularly emotive vocal as the gardener who has fallen in love with the daughter of his wealthy employer. One of the group's finest album tracks, it's performed in a baroque style similar to that of The Left Banke. "Breakaway reflects the group's love of the Motown sound. There's also some pure psychedelic nonsense in "I Am A Tangerine. (Hey, it hadn't been that long since The Electric Prunes did "The Great Banana Hoax.") "Smokey Roads chronicles Tommy's disappointing return to his home town, a theme later explored by Chrissie Hynde in The Pretenders' "My City Was Gone." 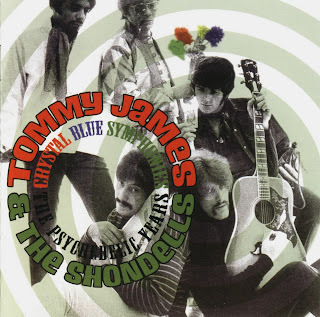 The remaining track on the album is "Crystal Blue Persuasion, simply one of Tommy's best records. Its soft, jazz-influenced sound, punctuated by Ed Gray's simple but effective performance on acoustic guitar, was perfect for the summer of 1969. For the single, horns were added to the last verse and the ending. The original version of the song appears here; the single version appears in stereo on the Anthology release. Just before the extended ending of "Crystal Blue Persuasion, there is a fairly audible whispered line. Were Tommy & The Shondells conveying a subliminal message? "No, Tommy laughs, when asked about it. "It's not supposed to be there. People thought I was putting in a subliminal message, but we were doing the background vocals and I was trying to cue the guys doing them. I think I said, 'Come in right now.'" "Crystal Blue Persuasion was receiving airplay as well, however, so Roulette decided to release it as a single in June, and it also went gold. Its success further stimulated sales of the Crimson & Clover album, which remained on the charts for 35 weeks. Consequently, although Cellophane Symphony was completed that summer, Roulette held back its release until October. Cellophane Symphony was one of the first rock albums to feature a Moog synthesizer. Tommy and the group structured the title track around a riff, layering it with synthesizer and other sound effects. It was certainly the most unusual track the band ever recorded. Tommy produced the album at Broadway Sound in New York. Tommy recalls, "Whitey Ford, of the New York Yankees, owned Broadway Sound. I went up there, and it was a great little studio. It had a Moog synthesizer, which looked like an old switchboard from the '20s. It was hard to work with, since it was all monophonic -- you couldn't get two notes at the same time. But I knew immediately that the synthesizer was going to be the wave of the future." While the Moog featured heavily on the album's title track, Tommy used it to embellish some of the other songs on the LP. The electronics are particularly effective in "Changes, one of the album's best cuts. Tommy remembers that for "Changes, he wanted something "very spacey and that it was "really a fun track to record. Vale's melodic bass lines and Lucia's percussive effects also stand out on the track. Its middle section, in 5/4 time, was quite unlike anything the band had attempted before. Tommy says the album was very experimental, and although the electronic effects are archaic by today's standards, they were novel at the time. Unlike Crimson & Clover, which was recorded entirely with conventional instruments, the Moog gave Cellophane Symphony a completely different feel. Tommy felt that the Moog produced "plastic music, thereby making the album a "cellophane symphony." The cover was an unusual as the music: it showed the group's name and the album title in small print at the top of a photo of an amphitheater with alternating positive and negative film strips. 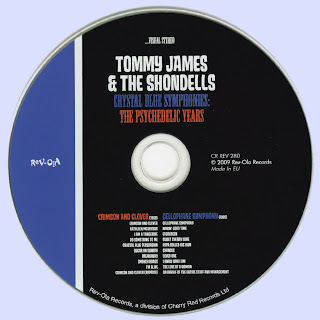 In retrospect, Tommy thinks he may have been a little too adventurous with the cover, as some record buyers probably didn't realize that it contained a new Tommy James & The Shondells LP. The Moog wasn't the only thing that set Cellophane Symphony apart from the group's earlier albums. It includes a wide array of sounds and ideals. "Makin' Good Time, a straight-ahead rocker, is followed by the ethereal mood of "Evergreen. "Loved One, one of Tommy's best ballads, is one of his favorite tracks on the LP. The group ventures into a country style (which Tommy would later more fully explore on his My Head, My Bed And My Red Guitar album) on "The Love Of A Woman, with Gray's solo played in the style of a steel guitar. The album also includes three comedic tracks. "Papa Rolled His Own, set to a music-hall backing, features a megaphone vocal by Tommy, as well as his best W.C. Fields and Walter Brennan impressions. Tommy also turns up as Ed Sullivan (bringing out "the crippled monkeys...here on our show") and John Wayne on "I Know Who I Am, and lets us know what really happens when one call the girl whose number is written on the bathroom wall. He sings the album's closing track, "On Behalf Of The Entire Staff And Management, in an appropriately off-key vocal as he presents Mr. What's-your-name with a gold watch (which doesn't work) for 25 years of loyal service. Meanwhile, the group occasionally chimes in while banging glasses, clapping half-heartedly, sneezing and talking its way through the entire presentation. Tommy is justifiably proud of the success of both the albums presented here. He remembers 1968 and 1969 as years of great productivity and incredible change. The albums reflect both of these aspects of the time. Above all, Tommy remains intensely appreciative of his fans. "I've got the greatest fans in the world. I really do, he says. "They are loyal; they've just been so good to me over the years."